I read an article in a newspaper about a woman who had a hard time getting rid of her old clothing. She hung onto things for years, even decades, because she felt a sentimental attachment to them. She finally decided that the only way she was going to be able to cull her wardrobe was to wear every single item in it for one day each. So she did. Some things she found so uncomfortable, that it was an easy decision. Some things were so out of style she felt foolish in them. Other things she was able to repurpose by combining them with newer articles. She was so attached to one particular item that she decided to put it in a box and store it. But then she had to ask herself, what good would that do? Would I ever take it out of the box and look at it? Does having it stored make me feel better? If her answers were yes, she kept the piece. If not, buh-bye. I can so understand her feelings about her clothing. There are a lot of items in my closet that I haven’t been able to part with because my husband picked them out. I have other pieces that were fashionable in their time and cost a pretty penny. They, too, have stayed. But I’ll be moving soon and need to condense my clothing to fit in a smaller closet, so I’ve decided to try the experiment. Having to wear the items all day is a real endurance test, let me tell you. But three days into it, I’ve got two tops in the donation pile and one shirt that’s staying. Up for tomorrow is a pencil shirt in light blue that I always thought looked a little sloppy on me. If I’m able to keep it on all day and feel good in it, it’s a keeper. Actually, the experiment is kind of fun. Would you be daring enough to try it? 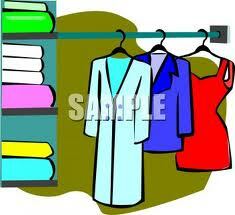 Do you hang onto clothing for sentimental reasons? I am in the process right now of going through every room, closet,and drawer in my house. So far I've made three trips to the goodwill and two to the library bookstore. The motto is: if I don't use it or love it I don't need it. There have been a few things I've thought about keeping, but then I've realized they have been sitting in the house for the past 10 years out of sight, and it would be much better to donate them and let someone else love and use them. But, yes there are a few articles of clothes I'll keep for sentimental reasons (they are in the love category). Good luck Kate. I think it is a good thing that you are doing your experiment. I used to, but since I had kids (who are now 4yos) I have used a tip my mom told me - if you haven't worn it in a year then it should go. That's my motto now. I've got clothes that are too small as well as too big in my closet, laundry room, and boxed up. Some I keep for sentimental reasons, some for hope (that they'll fit again). I'm not one of those women that gets all dressed up then doesn't go anywhere. I may shower first thing but I stay in comfy clothes for as long as possible. Recently my husband and I joined Weight Watchers and took off 40 pounds each. Long overdue. Then we had that Good Problem to Have: way too many huge clothes. This time, it was easy to get rid of a van load of stuff! But I dutifully tried every piece back on to see what was salvageable. The answer? Not much. I've never been so happy to get rid of things in my closet in my life. I like your idea, though, of making yourself wear things and see if you still really like them or just think you do. I've kept back a representative outfit or two, such as my favorite jeans from high school, but one or two items like that don't take up much space. Great subject for all Packrats. I came up with a new test for going through old clothes. I used to ask myself, "Will I ever wear this again?" And I usually convinced myself I would (especially if sentiment was involved). Now I ask myself, "If this were stolen, would I run right out and buy a replacement?" If I wouldn't need a new one, I don't need that one. It works for me. Great post Kate! I went through my closet last year, and gave away 12 garbage bags full of old clothes. I kept a lot too, but to be honest, I have not touched those clothes I did keep. So, time for another run to the Salvation Army. I cleaned my closet to make room for my boyfriends clothes when he moved in. Otherwise my motto is: if the closet can handle it, don't throw it away yet. But when he moved in, I went through all my closets and threw away many many junk. Adrienne in MN: would it be better to come in Spring or Fall. I don't think I could handle your Winters. Then you could come here (California) during the summer and we could have long breaks at the beach. I have a problem with getting rid of clothes - even t-shirts that are "manly" and have sayings or say...a wolf picture on it. I always think it'll be comfortable to wear but then I notice I haven't actually worn them in a very long time....so maybe I should try this experiment also. It's a good thing for a lot of us women to try, makes sense and should be easy to do, right? Thanks for this very timely post - my closet is so crammed with clothes that I don't wear that there isn't even room to hang up the clothes I DO wear. ;) which is very silly of me. I've got a discard pile started! There are two tops that I'm debating on. They feel good on but don't LOOK all that good. Hmm. Tough call. What should I do? This sounds like a great plan. Must try it! Are the two maybe tops around the house ones? If not are you willing to wear them OUT of the house when they don't look good. I say if in doubt, toss them out.